On a particularly dark stretch on the two lane road that traverses the reservation, a group of men appear in the opposite lane in the headlights of our vehicle and are waving at us to stop. They are a group of people without papers from Chiapas—hungry, thirsty, and visibly injured—migrating north through the Tohono O'odham Nation. This Native American reservation is increasingly becoming ground zero for the Border Patrol on the Arizona-Mexico border. It is 5:30 am and we are traveling down highway 86 in southern Arizona on the Tohono O’odham Nation. It is so dark and quiet that even the U.S. Border Patrol checkpoint outside of Three Points, approximately 20 miles to the west of Tucson, seems to be sleeping, despite the glaring stadium lights. Going west, we don’t have to stop, we just slow down. These checkpoints are on every road going out of the Tohono O’odham reservation, ground zero for the border enforcement apparatus on the Arizona-Mexico international boundary. Fifteen minutes later, on a particularly dark stretch on the two lane road that traverses the reservation, a group of men appear in the opposite lane in the headlights of our vehicle. Two of the men are waving at us to stop. Brother David Buer, a Franciscan friar, hits the brakes. Seven men approach us out the darkness and come to the back of the Samaritan's patrol vehicle. One of the men is visibly limping as he crosses the road. This is happening right as Hurricane Sandy begins to pound the east coast. While clearly the men migrating is a very different situation, there are also important similarities. Even though they are thousands of miles away from this powerful storm, it is as if their homes too got flooded and destroyed by a destructive force, and now they are on the run. They are visibly hungry, visibly thirsty, and some are injured. They are desperately thinking about their families. Brother David, who wears a long brown robe, looks at the limping man and asks them if they want to turn themselves in. No, they say. OK, let’s get to the side of the road, we say. Brother David hands me a plastic bin filled with food packets. He hands me the water bottles. The men are from Chiapas. One guy tells me, as he grabs a packet from the bin, that they haven’t eaten in three days, that they have been lost for three days. They are absorbing the water like they hadn’t had a drop in days. Their socks and shoes are speared with spines. We give them new socks. Although relieved, the men look scared, and duck down when a vehicle passes even though we, even in the morning darkness, are visible on the side of the road. Map created by Humane Borders. 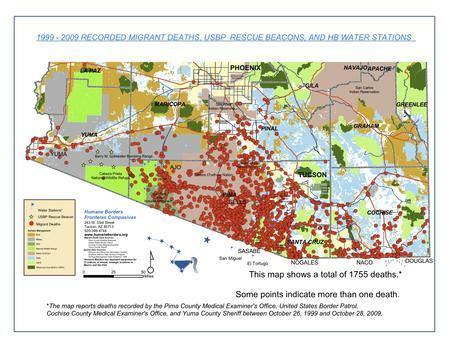 They have every right to be scared, on a map that shows where recovered remains have been found along the U.S.-Mexico border, there is a thick red cluster of dots on the Nation of people who became injured or lost or didn’t have enough water. And then there is the Border Patrol. There are more armed agents than ever before along the international divide with Mexico. Incidents in the last month of Border Patrol shooting and killing people in San Diego, Naco, and Nogales, add another dimension to the fear for people traveling through the desert, beyond capture, arrest, and detainment. Underscoring this further is the October 25 killing of two Guatemalan migrants by a Texas Department of Safety sharpshooter from a helicopter working on a border security mission. There are threats coming from every direction, from all kinds of law enforcement officers. According to Margo Cowan, former general council to the Tohono O’odham Nation, there was no Border Patrol presence on the Nation until 1993. Now, the Department of Homeland Security green-striped SUVs, trucks, cars, and vans are everywhere, at every turn. There are also ATVs, horse patrols, and Predator drones and Blackhawks and other “air assets” flying overhead. There are surveillance towers and scope trucks and a Forward Operating Base, which—as with U.S. military operations in Iraq and Afghanistan—are small, make-shift bases to facilitate “tactical operations” in remote regions. A Joint Task Force Substation that they have on the reservation is supposedly a collaboration between Customs and Border Protection (CBP—Border Patrol's parent agency) and the Tohono O’odham Nation Police Department, but looks more like a mini-Border Patrol station packed with a fleet of CBP vehicles and mobile surveillance trucks. Behind the substation is a chain-linked caged-in area where people are held before agents hand them off to the non-labeled, white Wackenhut bus, as everyone calls them (though Wackenhut has now changed its name to G4S), which will transport the captured migrants to Tucson for further processing and maybe prison time. Mike Wilson, a Tohono O’odham man who puts out water in stations on the reservation in defiance of the Nation’s legislative council, says that the Border Patrol on the Nation has become an “occupying army.” An Amnesty International report entitled In Hostile Terrain, not only underscores the constant violations to undocumented people traveling through this area, particularly death, but also how the border surveillance apparatus has impacted the O’odham people whose aboriginal land extends well into Mexico and has been bisected by an international boundary they never wanted. Amnesty International documents a constant pattern of harrassment against the O’odham, including a pattern of physical and verbal abuse, who now have more federal officers on their “sovereign” nation than any other time in their long, painful history of colonization and forced-assimilation. The presence of Border Patrol on the Nation is buzzing, entrenched, and now apparently expanding. Now besides the flow of agents from Casa Grande and Tucson stations, the Border Patrol has undertaken a massive expansion of the Ajo station, a 52,900 square-foot state-of-the-art facility. This greatly contrasts with the many aging buildings in the economically-depressed area which previously relied on now barely-functioning mines, another economic model that marginalized and exploited the Tohono O’odham, who were the lowest rung of a racially-segregated wage hierarchy (whites were at the top). You can almost see the tailings of the former copper mine in Ajo (closed in 1985) from the Border Patrol station in Why, an uneasy symbol of one economy replacing another. The station now can accommodate more than 360 personnel with room for future growth, significantly outnumbering the previous capacity for 25 agents. It lies just a hop, skip, and a jump from the boundary of the O’odham reservation. This new station is all about green energy, using solar panels for power and the station’s design is based on “economy of motion” which follows “agents activities and natural movement to increase overall efficiency.” The Storm Water Pollution Prevention system ensures that water will leave as clean as when it entered the facility. 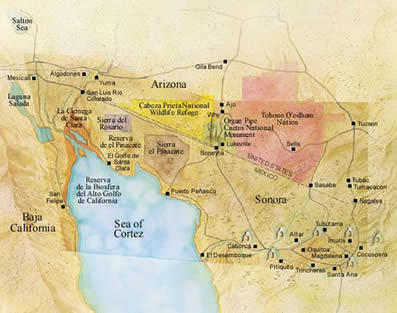 The massive expansion of the border policing apparatus into this area, which also includes the Organ Pipe National Monument and the Barry Goldwater Bombing Range, will mean more significant economic, political, and social transformations for the area. The Border Patrol station almost looks futuristic and Jetson-esque compared to the rugged situation of rudimentary homes on the Tohono O’odham reservation, where there is an unemployment rate of 35.5% and more than 40% live in poverty. CBP has found most housing options in the local real estate market (mostly off the reservation in the towns of Why, Lukeville, and Ajo) to be “substandard” for its increased personnel and is now constructing CBP housing in Ajo. The block style one, two, and three bedroom homes have a tacky modernity compared with the old homes throughout this small town of approximately 4,000. Tohono O’odham activist Ofelia Rivas worries that a new sports bar in Why will cause “drunk” agents to drive “95 miles an hour” on their highways. Meanwhile, the seven men are going to Tucson and will continue to go to great length to avoid the border security apparatus developments in Why represent. And the men are not alone: A new report suggests that after a number of years of decreasing migration from Mexico, there might now be an uptick. Unfortunately we cannot transport the men. As members of the Samaritans, we are only allowed to provide them with their basic humanitarian needs. So we leave them with food and water. As morning is slowly starting to appear to the east over the Baboquivari range that divides the Tohono O’odham Nation from the Altar Valley, the men are still in crisis as they walk to the east into the dawn.